Each weekend I try my best to vacate Bangalore in search of fresh air or for sites with historical or cultural significance. One such outing was to Nandi Hills, a giant block of granite that rises 1.5 km high. Once atop this monolith, I wandered across the uneven and rocky terrain (not to be confused for Bangalore “roads”) and surveyed the landscape in all directions. One point is known as Tipu’s Drop, where the famous sultan had his prisoners tossed into oblivion. This practice has not endured into modern times, so the point is now a favorite destination for lovers to commit suicide. On November 1st (Karnataka Day), Bangalore was officially renamed Bengaluru. This provides scope for considerable confusion as I am a Bengali from Canada in Bengaluru where they speak Kannada. In related news, the Bangalore Banger monicker was dropped in favor of the Bengaluru Tiger. My Bangalore Bengaluru office is located in the northern outskirts of the city in a place called Hebbal. It is a newly constructed facility. So new, in fact, that construction is still taking place on some floors while others are already inhabited by workers. The walls in the stairwells are covered by red stains, which are remnants of chewing tobacco and paan which are frequently to be found in the mouths of construction workers before being spat out in dramatic fashion. Hebbal is a combination of a dusty village and several burial sites of different religions (including a Parsi tower of silence), with a business park planted in the middle of it. It takes between 45 minutes to an hour for me to commute to my workplace, which is reasonable in comparison to the multi-hour one way travel times of several coworkers. For an additional fee, Satyam provides a daily bus service to its employees. The bus stops around 2 kilometers away from my flat. Usually, I take this bus on the way back from work. In the morning I take an auto rickshaw since I do not wake up in time to catch the bus and since I am not going to walk 2 kilometers twice (4 kilometers!) in one day. As the world celebrated Arnabmas with happiness and delight, the citizens of Kolkata rejoiced with additional fervor as the first day of Durga Puja (the largest festival for Bengalis) and ARNABirth coincided on the same auspicious date. My time in Kolkata was devoted to visiting my many relatives and in experiencing Durga Puja to the fullest. Accompanied by a Taiwanette, I visited as many pandals (elaborate platforms containing the idols) as possible and also attended a Durga Pujo that took place on a barge on the mighty Ganges (Ganga) river. One day I was approached by a beggar who said something to me in rapid Hindi. Being a frequent viewer of Bollywood movies and a heavy visitor of matrimonial websites, I only understood the word shaadi, which means marriage. I also assumed the beggar’s request had something to do with money. I interpreted the phrase as “My sister is getting married, so please give me money”. My Hindi-speaking coworker informed me that what was actually said was “Give me money and I will pray for a quick and happy wedding for you”. The complete article about the Arnabian delight can be found in the October 2006 issue (page 5). On one long weekend, I ventured to Maharashtra with the goal of exploring the famed Ajanta and Ellora Caves along with 3 South Koreans and another Canadian. The nearest major city to the caves was Aurangabad. In and around the city we visited Daulatabad Fort, complete with cannons, moats, bat infested tunnels, and other hazards, and also Bibi ka Maqbara, the “poor man’s Taj Mahal”. Ajanta contains only Buddhist sculptures and paintings compared to Ellora’s broader range of Buddhist, Hindu, and Jain artifacts. Nonetheless, I preferred Ajanta due to its spectacular natural backdrop. Having finished the caves in two days, we had a day too spare. Pune was nearby so we headed there. In Pune, I went to the zoo, parks, gardens, and a building where Mahatma Gandhi had been imprisoned. On the train journey home, we celebrated the birthday of my Korean roommate, with cake bought at the train station and some Rums Up (composed of India’s favorite soft drink, Thums Up, and another popular liquid). This is the result of many days of research. The plan is to visit as many sites as possible! a. Turn the ignition key off. b. Stop the engine, lock the ignition, remove the key, and set the hand brake. a. Attracts strict warning from the authorities. b. Is an invitation to accident. c. Is an offence and is punishable under the law. a. Yield or give the pedestrian the “right-of-way’. b. Proceed with care as pedestrian is ‘joy-walking’. c. Reduce speed and warn pedestrian. a. Not obligatory to furnish it. b. It is obligatory to furnish it. 102. Why do we have speed limits? a. To keep the traffic within a safe speed for existing condition. b. More vehicles can be used on roads. c. Authority can identify who is speeding. a. Obligatory to stop the vehicle. b. Mandatory to stop the vehicle. a. As to and wait until it clears the road. b. Pass if from front. c. Pass it from behind. a. Always in the direction specified by sign board. b. Reverse direction in emergencies. c. Both ways on Sundays. c. To correct your attitude in future. The complete practice exam can be found on Karnataka’s Road Transport Office website. Between Hyderabad and its sister city Secunderabad lies the man-made Hussain Sagar lake (or “God’s gift to Hyderabad” as the signage proclaims). In the center of the lake is an island containing a gigantic Buddha Statue, which is illuminated once darkness approaches. When the statue was initially being ferried to the island it sunk. A few years later it was rescued from the depths, perfectly intact. I took a pleasant boat ride to visit this monument. The Ganesh Chaturthi festival is celebrated with much aplomb in Hyderabad, with the bulk of the celebration centering on the lake where thousands of Ganesh idols are immersed. A substantial portion of the general population attends the event. After some strenuous, shouting, dancing, singing, powder spraying, and exploding of firecrackers, 3 or 4 men load the large idols onto a platform, which is then dropped into the water with the assistance a crane. I feasted on a plethora of intriguing creatures such as rabbit, pigeon, and quail. These had to be ordered several days in advance, so that the restaurant owner/meat provider would have sufficient time to acquire the specimens from the “farm”. The tandoori rabbit was the most delicious of the bunch, followed closely by the pigeon. Arab-speaking companions found it humorous that Arnab (“rabbit” in Arabic) was eating rabbit. While a single rabbit can feed three grown men, it is advisable to order 2 pigeons per person as they do not contain much meat. Quail tastes like a combination of chicken and egg, which makes it quite a delicacy. Due to my pending departure to Bangalore a few more farewell parties were held (9 in total). ARNABash (intern edition), ARNABash (coworker edition), Arnaberfest, and the Arnab Poker Challenge were attended by various luminaries. To illustrate the diversity of Satyam’s Crossover internship program, there were attendees from Australia, Brazil, Canada, China, Germany, Holland, India, Mexico, Poland, South Korea, Sudan, Sweden, Turkey, and UAE. Alas, I had to separate myself from my biryani and depart the City of Pearls, but my immediate destination was to be the City of Joy, rather than the City of Gardens. Due to some technical issues that delayed my transfer to Bangalore, I was granted a vacation to Kolkata while the matter was being settled. ARNABombshell Status: Boiling Hot! A suspected change in the weather patterns had made the female interns frosty. As news of my imminent exit from the local landscape reached the ears of the international ice princesses, their chilly disposition towards the Hyderabadi heartthrob melted away. Lunch, dinner, and other invitations were accepted by almost all. Full details will be revealed in the ARNABiography, to be published at a much later date. Diwali and Eid, major festivals for Hindus and Muslims respectively, occur within a week of each other and have merged into an unofficial weeklong national holiday. During DiwalEid I planned to escape the urban chaos of Bangalore for the luxurious greenery and beaches of Kerala. With catchphrases such as “On earth there is no heaven, only pieces of it…” and “God’s Own Country”, Kerala was able to live up to its boasts. My trip began in Cochin, a collection of islands and an area on the mainland that combine to form a natural harbor. Some of its attractions are Chinese fishing nets, the oldest church in India, and a Jewish settlement (appropriately known as Jewtown). Next I went on a 22 hour backwater trip through the canals and waterways of Kerala while relaxing on a houseboat complete with cook, pilot, and a motor. I was accompanied by a German. Following this we headed to the capital city of Kerala, Trivandrum and visited beaches such as Varkala and Kovalam. One day was spent journeying to the neighboring state of Tamil Nadu to visit the tip of India – Kanyakumari. A brief but turbulent ferry ride transported me to the Vivekananda Rock Memorial and a giant statue. Adhering to Indian subcontinental tradition, the ferry was overloaded. At this point, the Bay of Bengal, Indian Ocean, and Arabian Sea converge and it is possible to see the different shades of water. For my transfer to Bangalore from Hyderabad, Satyam generously provided me with two weeks of hotel stay. The hotel was located in a central part of Bangalore called Austin Town. To be more precise, it was officially in Austin Town Extension, or “Echechu” as the rickshaw drivers preferred to call it. My first impressions of Bangalore were below expectations. When coming to Hyderabad I had no expectations, and they were greatly exceeded. For Bangalore, on the other hand, I was expecting a shining IT hub. What I saw resembled more of a petting zoo than the “Silicon Valley of India”. Apart from the generic cows and dogs encountered on many Indian streets, there were also chickens, goats, boars, rodents, and horses roaming around. The sewers are covered by a series of imaginatively shaped concrete slabs which combine to form the sidewalks. Frequently they are missing, leaving holes of varying sizes for the inattentive passerby to trip on or fall into. What Bangalore does have in common with North American metropolises is the congested traffic and heavy pollution, which causes me great discomfort. To my added disappointment, mixed accommodation, even for foreigners, (i.e. Males and females living in the same apartment) was a taboo. This was unlike Hyderabad or Chennai, two places considered to be much more conservative in their outlook. Thus my options were reduced to (1) living with non-Indian males or (2) living with Indian males. The decision between these two undesirable options came down to one thing – bathrooms. Option (1) would have involved sharing 3 bathrooms between 14 people, and option (2), 3 bathrooms between 8 people. Option (2) prevailed due to its superior 14:3 male:bathroom ratio. Incidentally, that is also the male:female coworker ratio at Satyam, which is still preferable to the 9:1 ratio encountered in the Computer Science department at university. I moved into a flat in a residential area of Bangalore called Cooke Town by some and Cox Town by others. Cockroaches have an affinity to my room in this flat, particularly to my bed sheet and towel. Being a noble and glorious soul, I bought a canister containing some form of poison gas and went on a cockroach crusade. ARNABombshell Update: Cold (or 25 degrees for Indians). The absence of female flatmates, an average 9pm curfew for girls staying in hostels, paying guests, or with their parents, and vegetarian dietary habits severely restricts my access to or interest in the Bangalore bombshells. For the second time in as many months my Arnab Sense failed me, and again I was the unknowing victim of an aerial assault. I only noticed the malodorous kernels once I had sat down and my hand had skimmed a gooey substance. I discovered a partially dry beige stain on my right pant leg. Previously, I had disregarded the stench as that of the sweaty locals, my own ArnabBO, or a potent combination thereof. It must be mentioned that ArnaBO (Body Odor) is most effective in neutralizing the raw attractive force generated by the ArnaBeard. Following the advice of my elders who had informed me that heavenly bombardment is a blessed event after the previous incident, I wore the same pants for the rest of the day. Advice on ARNABride from a concerned citizen: "You have to find the girl who you can always want to take care of her because you so so like her." Female Korean flatmate (no longer beguiled by my masculine charms): Like you know, I’m not your mom who have to do everything for you. As was the case with the previous one, this maid also did not speak a word of English or Hindi, knowing only Telugu. Communication occurred primarily in the form of hand gestures and facial expressions (of which I have a limited repertoire), but was largely successful. When she appeared at the doorstep decked out in her finest traditional Indian clothing on the day of the Ganesh festival and kept asking if I wanted her to sweep the floor, it was easy to determine that she was asking for a day off. The occasional misunderstanding did occur though, such as when my flatmate from Dubai could not locate his CD collection. He queried the maid for the whereabouts of his media, but the maid confused his question for an accusation of theft. For the next few days she had a sad face containing evidence of heavy tearfall. The source of her misery was deduced through masterful interpretation of linguistic nuances, and the Telugu speaking landlord was asked to speak to her and clarify the situation. 10:00 am - Arrive at workplace. 10:15 am - My reporting manager (boss) gave me detailed instructions to locate the offices of my unit (Consulting and Enterprise Solutions). Following his advice I reached a door with a sign taped on it - "Use other door". 10:20 am - Reporting manager tells me to wait in front of the door. Contact person will come to meet me. 10:50 am - No one has come to meet me. 11:05 am - Stumble upon alternate entrance. I ask for the whereabouts of the contact person I am supposed to meet. One helpful Satyamite responds "He is out for lunch. Come back in a few hours". 1:30 pm - Return to office after a refreshing buffet meal at the cafeteria. I ask for the whereabouts of the contact person I am supposed to meet. One helpful Satyamite responds "He is out for lunch. Come back in a few hours". 4:00 pm - Return to office after a refreshing sleep in the sofa located in front of the women's washroom. I ask for the whereabouts of the contact person I am supposed to meet. One helpful Satyamite responds "I'll let him know you are here". I find an empty workstation and sit in front of it. 6:00 pm - Contact person arrives and informs me that the training session has been postponed for two weeks as an empty conference room in which to give the lessons was not available during this period. I will have to train myself until that time. 6:30 pm - Leave office. For the following two weeks I spent my time going over documentation related to Product Lifecycle Management (PLM) and the particular software I would be working with (Agile PLM). One fine Tuesday morning, I was strolling down the street looking for an auto rickshaw to take to work. Suddenly, an unidentified flying object deposited its droppings on my shoulder. Due to the harsh climate, my excrement detection and avoidance system was malfunctioning. Without adequate warning, I was unable to react to the incoming aerial bombardment. My shirt was left with a greenish stain resembling the gravy of the mint alu (potato) found in the Satyam cafeteria lunch buffet. I had to quickly return to my abode and change garments, before continuing on my journey. Apparently, this auspicious event is a sign of good luck in several cultures. A French Canadian intern was confused as to why Indians used water rather than toilet paper to cleanse their cheeks and the chasm between. An intern of Punjabi descent recounted his father's explanation for this cultural phenomenon: "When someone drops some food on a table, wiping it with a paper towel is a quick fix. But to really clean the mess, washing it with water is a much more effective solution." Having vacated the living room, I now share a room with a Korean guy. The other Korean chap who used to live in this room departed for greener pastures with fewer mosquitoes. My roommate has managed to befriend a fellow who is both an university student and rickshaw driver rolled into one. He also has a brother with long hair who rides a scooter. The dynamic duo invited him to their sister's wedding, and even gave him an auto ride to the wedding hall. My flatmate from Dubai is suspicious of these individuals. He told us a cautionary tale of an intern who was once befriended by an Indian on the street. Together they went to a few clubs and parties and had a thoroughly enjoyable time. One day the Indian friend approached the intern in desperate need for money. He needed to borrow two thousand rupees immediately. He showed the intern his ring, convinced him that it was worth a fortune, and gave it to him as collateral in exchange for the money and left, never to be seen again. The next day the intern discovered his cell phone was missing and further investigation revealed that identical rings could be purchased from local street vendors for a pittance. My flat consists of two levels. The lower level consists of a spacious courtyard with adjacent rooms on two sides in an L shape. The I part of the L contains the kitchen, large bathroom, and the living room. The _ part of the L contains two bedrooms and a smaller bathroom. 2 guys live in each of these rooms. Until a fortnight ago, there were 5 men in the flat so I stayed in the living room. Now I have moved in to an actual bedroom. All ceilings on this level are covered in cobwebs, including the kitchen. The bathrooms are filthy and contain many indescribable wonders. The large bathroom contains an Indian style (crouch and relax) toilet. The smaller one has a Western style (sit and concentrate) toilet that was recently outfitted with a seat due to the generosity of the landlord. The flushing mechanism is not fully operational so buckets of water in conjunction with a bum shower (a gun shaped mini shower used to clean the rear) are utilised as an alternative method of waste disposal. The upper level consists of only one room, where two girls reside. It has no cobwebs. The bathroom within it is relatively sanitary, but I am forbidden from using it. For large companies in the Indian IT industry it is customary to acquire human talent before there is an actual business demand for these resources. These international firms often demand a list of available resources and their skill sets before signing a contract for a project, creating a need to have extra staff on hand all the time. In an environment where speed is king, this technique eliminates the ramp up time related to hiring and training talent that is usually encountered before starting a project. This creates the odd situation of many employees who are being paid to do nothing but wait for a project to begin. In Satyam lingo, these people are assigned to a pool known as "Business Wait". While awaiting my assignment to Bangalore, I have utilized my free time most efficiently. My primary activities are traveling the nation and visiting my relatives. Secondary activities include playing cards, going to movie theatres, watching Hindi music videos, and accompanying damsels on sari shopping expeditions. Hampi (2 days) - A totally different form of India with a relaxed atmosphere and no crowds. Formerly the capital of an ancient civilization, this World Heritage Site contains many ruins of temples and forts. The landscape contains massive boulders perched in strange positions. Hired a rickshaw for both days here and the driver also functioned as the tour guide. A group of 19 interns went on this excursion. Some of the temples are atop high hilltops so lots of hiking and climbing is required. Being slow, I fell behind the rest of my group. Suddenly I was surrounded by approximately 20 menacing monkeys. Fortunately, I did not have any bananas so they soon departed. Delhi (7 days) - Visited my uncle, aunt, and cousin's family. The highlight was my visit to the Supreme Court of India, where I listened to a gruesome murder trial and a spicy divorce case. Also went on a drive to fort/palace that has now been converted to a hotel in Neemrana. Lucknow (2 days) - Around 6 hours from Delhi by express train, I visited both relatives and tourist attractions here. Stayed at a house that is almost 200 years old. Chennai (4 days) - One of the my two Korean flatmates had moved away to Chennai for her job, so I visited her for the Independence Day long weekend. I took a Chennai city tour, went shopping, dined at several Korean restaurants, visited beaches, temples, zoos, amusement parks, and museums. I also took the local bus on several occasions as auto rickshaw drivers refuse to use the meter in Chennai. Once I was hanging from the door until the conductor told me to get in. Another time I met a fellow software engineer who was delighted to find out that his salary was greater than mine. We also had a traditional home cooked meal at the house of one of her colleagues with the men in the living room and the women in the kitchen. Also visited the nearby temple towns of Kanchipuram and Mahabalipuram, another World Heritage Site. Arnabombshell Update: To the dismay of my loyal readers, this section was missing from previous posts. The female intern community has warmed up to the Arnab Sensation, but I still have not had a chance to mingle with the local ladies. The Mumbai maidens stayed indoors due to the monsoon. The Hampi hotties, Chennai chicks, and Lucknow lasses were similarly nonexistent. The Delhi delights were present but appeared to be quite high maintenance. I am supposed to work in Bangalore. Every once in a while I am led to believe that I will actually be departing soon to this city, so a farewell party is held in my honour. At one of these exclusive events, an interesting Korean party game was played. Everyone sits in a circle and in a clockwise direction takes turns saying a number or clapping beginning from number 1. The object of the game is to say the number when it does not include a 3, 6, or 9 and clap otherwise (ie. 1, 2, clap, 4, 5, clap, ...). You must also clap the number of times that a number contains these three digits (ie. 35 is one clap, but 36 is two claps). The game continues until someone messes up the sequence. They are subsequently punished in a humiliating fashion. In the non-alcoholic version of the game, the victim must lie on his back while everyone else beats him for a short period. To make the game even more difficult, there is a variation where the word "Asa" must be said in place of every number that can be divided by 5. Korean guy on seeing dead dog laying on street: "Someone wasted food." One fine day I was awakened by a maiden from another flat. She told me to get ready in 10 minutes, as a car would be coming to pick me up. I inquired as to why. She informed me that I had an interview in half an hour. I had no time to shave the ARNABeard, but was able to get ready apart from that. This was the first time I had heard about it. The interview went decently and six weeks later I am waiting to start that job. Late at night in a drunken stupor, my Brazilian roommate couldn't find his toothpaste. To his relief, he stumbled upon a tube that had a picture of a smiling family on it and the words "Safe" and "Effective" on it. He began to brush his teeth but noticed the paste had a strange taste. He had in fact found my lost bottle of Odomos mosquito repellant. A five year old Indian boy by the name of Prince fell into a 50 foot deep hole. By the time he was rescued he was six years old. It took the Indian Army around 50 hours to save him. When asked of his emotional state while stuck in the hole in the ground, Prince replied that he was feeling low. I have landed a job in the city of Bangalore with Satyam's Consulting and Enterprise Solutions (CES) division. I have no definite start date but will be heading over there soon. Before I leave Hyderabad, I have to see some of its finest attractions. Unfortunately, the majority of the populace has limited aesthetic appeal. However, its historical monuments are worthy of further description. I went on a bus tour with my fellow interns. The first stop was the Salarjung Museum, which is a museum in the truest sense of the word with treasures and artifacts from across the globe. The highlights were the collection of ivory carvings and the armory. The next stop was at the aptly named Charminar, a 400 year old structure supported by four minarets. I also visited the nearby Mecca Masjid. The final stop was the magnificent Golconda Fort, where I witnessed the sound and light show that explained its history in a creative manner. I went to the local movie theatre to see Krrish, an Indian superhero movie. It was quite entertaining, although there were no English subtitles. The theatre is a high security facility, complete with a metal detector and body search. It now takes me on average less than 2 minutes to cross the street. It is much easier if you attach yourself to a horde of locals also intent on crossing at the same time. I was unsuccessful in my attempts to convince the female interns who have yet to find positions at Satyam to accompany me to Bangalore to be my live-in maid. On Saturday, monsoon season began. Thunder. Lightning. Rain. Power went out for the night. Couldn't sleep since it was so hot. Went outside to relax and was swarmed by beautiful women bats. Went back inside and was bitten by beautiful women mosquitoes. 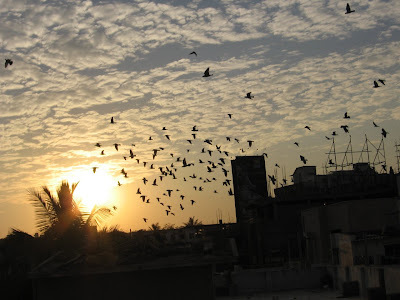 On Sunday, I went to a party held on the rooftop of a Hyderabadi flat (apartment). The day was cool after the rainfall the previous night, as the sun set behind the Birla Temple. Monday I went to the Satyam Induction Program - a daylong event where all new trainees are introduced to the company. The event took place at Satyam Technology Centre, which resembles a resort with manicured gardens, a golf course, tennis and basketball courts, gym, swimming pool, spa, and stables. However, new trainees are not allowed to use any of these facilities. Lunch and snacks were provided. There were 12 international trainees (including myself). The remaining ~150 were real Indians. We were given speeches by department heads and shown inspiring videos depicting Satyam's history, leadership, and bright future. My first day at Satyam I was supposed to get my ID card and bank account. After 9 hours of sitting around waiting and filling out forms I was able to open my bank account. One guy made sure each of my signatures matched the one in my passport precisely. I had to redo some. The ID card I have yet to receive. Second day I had a meeting with a project manager of one of Satyam's departments. He liked my resume/profile and wanted to know if I was interested in a position with his team. I said I will think about it and he said he will let me know on Monday whether he wants me or not. On Day 3 I was given an overview of Satyam's organizational structure and notified the HR department of my skills, interests, and job preferences. I had lunch at the Satyam office for 30 rupees. I ordered chicken fried rice but the guy behind me in line (the line starts from both directions) swiped it, so I had something else instead. I am in Hyderabad now (at an Internet cafe)! I am living in an apartment in the Banjara Hills district with 4 Koreans, a Brazilian, and a guy from UAE. I travel around to get food and supplies via auto rickshaw. My first day at Satyam will be tomorrow. I graduated from Simon Fraser University with a Bachelor of Science in Computing Science and Business Administration. Let the adventures begin!